Arval has become a leading partner in one of the UK’s largest hydrogen fleet car trials to date, enabling it to gain operational insight into the running of hydrogen fuel cell cars by fleets. The leasing and fleet management specialist is taking part in the Hydrogen Hub initiative, which will see fuel cell technology tested in a wide range of domestic, commercial and transport applications in Swindon, where Arval’s UK head office is based. Initially, two vehicles will be leased to local companies by Arval, subsidised by the Government’s Office for Low Emission Vehicles. These are a Hyundai ix35h for the National Trust and a Toyota Mirai for Nationwide Building Society. Arval will also take delivery of a Mirai to operate as part of its own company fleet. Other vehicles will also be delivered to local companies as part of a linked bid structure to which Arval will provide management support. The trials will be supported by the existing public hydrogen fuelling centre in Swindon – plans are in place to open another early in 2017 – while local Hyundai and Toyota dealers will be able to offer the capability of servicing hydrogen cars. 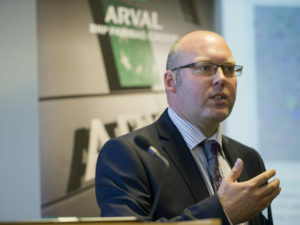 Arval added that it plans to share a large part of its findings with customers and the wider industry.